I've written a brand new Sean Duffy story for my old friend Dan Stone's Radio Silence magazine. It's a one off story not connected to anything that I imagine takes place several months after the end of the events in Gun Street Girl. I originally gave it the very literal title of The Champ's Visit To Belfast - A Fantasy but Dan has called it the more interesting Shadowboxing. Muhammad Ali came to Ireland many times over the years. The two most famous visits were in 1972 to fight Alvin Lewis at Croke Park and in 2005 to visit Ennis, County Clare which was the ancestral home of his great-grandfather, Abe Grady. In Shadowboxing I reimagine the latter visit taking place two decades earlier in 1987. 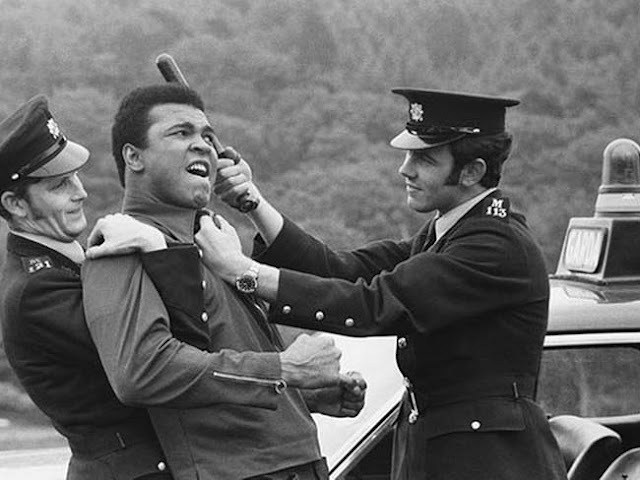 After visiting Ennis, Ali travels up to Troubles torn Belfast where a nervous Inspector Sean Duffy is on crowd control duty. You can read the full story, Shadowboxing, here. Radio Silence is a magazine of literature and rock & roll: the two other pieces I've written for them are both non fiction. I've done an article on the Van Morrison album Astral Weeks for the second print issue and an article on the Radiohead song, Creep that you can read, here.